`That same Friday, February 17th, 1978, there had been the first tournament at Udhailiyah's new golf club, Wadi Al-Saeed Country Club. Although things were going full steam ahead there and he had no more problems with the government, Roy Steindorf had decided he had rather go back to the States than move down there permanently. So he had requested and received permission from his parent company, Exxon, to transfer back to the States, and they would be leaving in about a month. That made me sad and brought home the actual reality of all the changes that had been and would take place in our life over there. On Saturday, February 18th, my boss Art Spitzer left on vacation, so a substitute superintendent, John Wilcox, was sent from Community Maintenance in Dhahran to take his place for that period of time. Jeanine King hadn't returned from her trip yet, so I was still the substitute secretary in that office. One of the first things the acting superintendent said to me was that he was unfamiliar with that office and was going to rely on me to help him run things while there. Well, that just cracked me up because I was the acting secretary, and although I had four months experience in that department, I felt like it would be "the blind leading the blind". We took a casual attitude though, and everyone else in the department continued to do a super job, thank goodness, so we got along just fine. 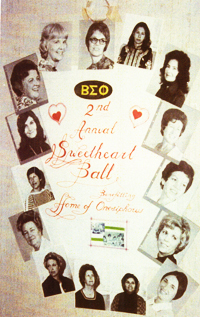 Pictures of all the Sorority Members on the Sweetheart Ball poster. 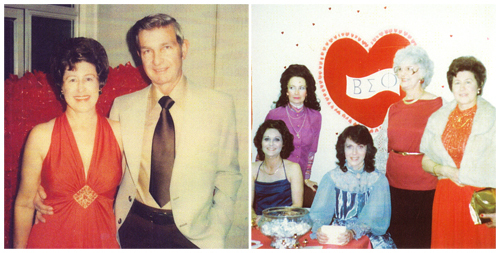 The Abqaiq second annual Beta Sigma Phi Sorority Sweetheart Ball was the following Thursday, February 23rd, 1978, in the Ain Nakhl Clubhouse. All of the members in the Kingdom had put in a lot of hours and hard work on it and it was successful. It was the main charity money event of the year, and our queen was selected as well. That year it was LuJean Yates. Sweetheart Ball: the sign in table with Sheila Kaul, Marge Desantis, Colleen Wilson, with Renee Scott and unknown seated; Colleen and Oran dressed to the 9’s. A couple of unusual things happened on Saturday, February 25th. Kathi Steindorf had an emergency appendectomy in the Dhahran hospital, and our son, Keith, took a job with the Western Company in Woodward, Oklahoma. Oran had been trying to get him on with Aramco since his graduation from college, and it was looking pretty good, but when the opportunity with the Western Company came up, he just took it. A friend who had been staying with him in our house in Richardson would just continue to stay there until we got home. The house had always been a worry to Oran while we lived in Saudi Arabia, and Keith being gone would be an additional problem. Jeanine had gotten back from her trip, so she started back to work again the next day. I was sent back to the "call room" to help wherever I was needed, and also started working shorter hours again. That suited me just fine as I was able to go to Dhahran Tuesday afternoon to visit Kathi in the hospital. She was doing just fine and would be able to go home soon. After our visit I caught a bus to shop in Al-Khobar for awhile before returning to Abqaiq. Going away party for the Steindorfs: The whole group at the Wilson’s and at the Women’s Club Luau afterward. 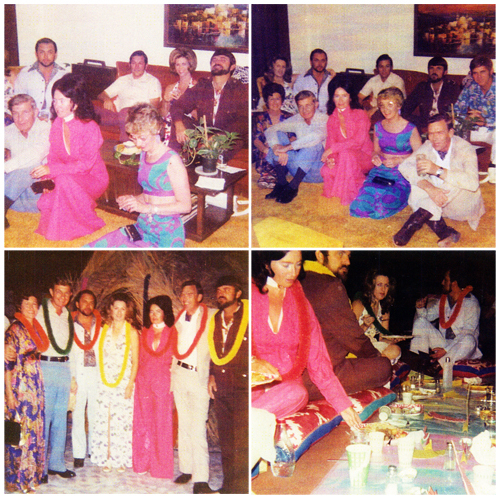 By the following Wednesday evening, March 8th, 1978, Kathi was back in Abqaiq and well enough to attend the going away parties for she and Roy that had been planned for that weekend. First we had all their friends come to our house for a party on Wednesday night. The following night, George Stein provided real scotch and dinner from the ACC Dining Hall for all of us at the Kaul’s. Afterward, we all went to a dance in the school gym with the music furnished by a group called "The Harmonizers", from the Philippines. Kathi didn't do much dancing, but I think she and Roy enjoyed the festivities and the effort her friends had gone to for their "bon voyage" parties. Roy and Kathi at the party; Dinner with their group of friends, Sandy Adams, Roy Steindorf, Sheila Kaul, Colleen Wilson, Keith Kaul, Oran Wilson, Marge and Marvin Williams; Friends gathering before the dance with Roy in the middle. The following week on Sunday, Kathi, Sheila, and I caught the 3:30 bus after we all got off work to make one last shopping excursion together to Al-Khobar. It was fun and sad at the same time, and we were trying to savor one of the activities that had been such a pleasure to all of us over there. While we were doing that, Oran, Roy, and some of the guys were having a stag going away party at Keith Kaul’s. Then, too quickly, Kathi, Roy and their kids were gone for good on Tuesday, March 14th, as they flew back to the U.S. via the far-east, Hawaii, and Seattle, Washington, where they bought a corvette and drove back to Alice, Texas. Fortunately, we would have more fun filled times together in the future, although it was hard to imagine then.